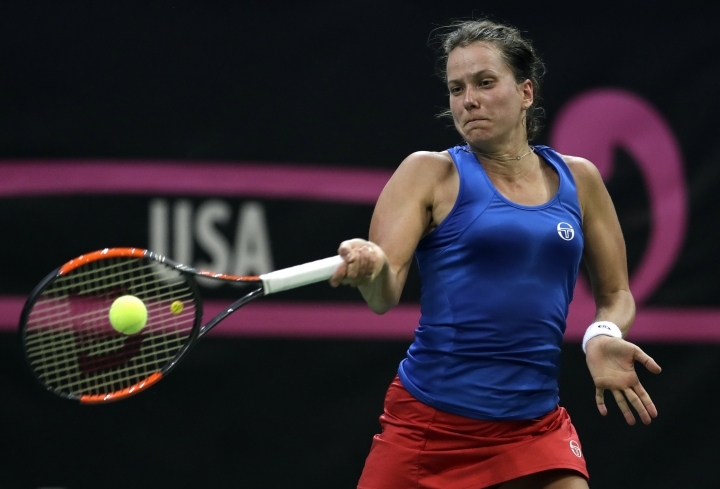 PRAGUE — Barbora Strycova rallied from a set down to give the Czech Republic a 1-0 lead over defending champion United States in the Fed Cup final on Saturday. Playing in the last Fed Cup fixture of her career, the 32-year-old Strycova overcame an early scare to defeat Sofia Kenin 6-7 (5), 6-1, 6-4. The American teenager was making her Fed Cup debut on the indoor hardcourt at Prague's O2 Arena. Strycova served out the match with a backhand winner at the net on her first match point to improve to 11-7 in Fed Cup singles. The 33rd-ranked Czech broke her 52nd-ranked opponent in the opening game of the decisive set to take control with a 2-0 lead. The 19-year-old Kenin looked nervous in front of the Czech crowd, serving three double faults to trail 5-2. But Strycova failed to serve the match out as Kenin broke back. Both players made 32 unforced errors and the American had 23 winners — two more than her opponent — but Strycova made her experience count in the decisive points. Kenin wasted two break points in Strycova's first three service games in the second set and was broken twice to allow the Czech to go 5-1 up and serve the set out. After trailing 3-1 in the opening set, Kenin prevailed in the tiebreaker. "I was very nervous at the beginning," Strycova said, adding that "at the second set I started to move much better and I also served much better which helps me a lot." Katerina Siniakova plays American Alison Riske in the second singles rubber. The Czechs are seeking their sixth title in eight years. The United States, the most successful Fed Cup nation, won its 18th title last year against Belarus.